A tropical paradise with an unbeatable location right at the epicenter of fun. We think every island paradise should have three things: sun, sand—and tons of palm trees. 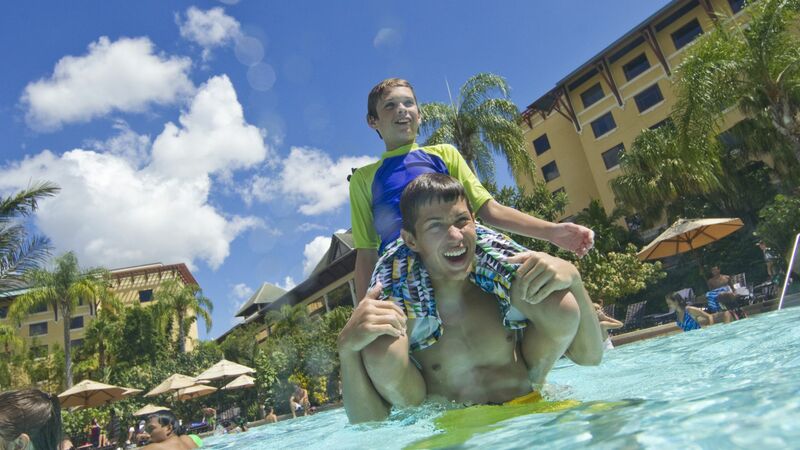 Good news: at Loews Royal Pacific Resort at Universal Orlando Resort™ you’ll find all three, plus so much more. This is your chance to enjoy a South Seas vacation without sailing halfway around the globe. Feel the excitement of a time when adventurous travelers first island-hopped the South Pacific. Since we're located on the grounds of Universal Orlando, and all guests receive exclusive theme-park benefits, the thrills couldn't be any closer. After hours of excitement, come back to explore our lagoon and sandy-white beach. 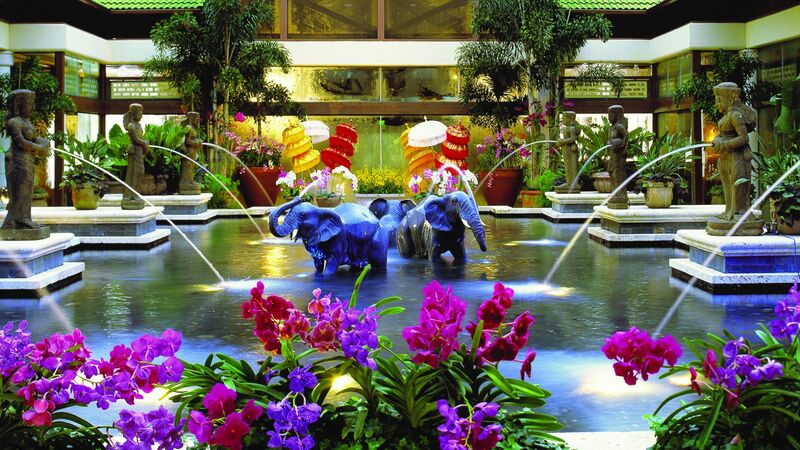 Sip a mai tai in our Orchid Court Lounge and enjoy its shimmering reflection pool—where you can watch the waters dance past carved statues of imperial-style elephants. Or take the time to savor our colorful Balinese umbrellas, called tedung; a symbol of protection and date back to the 13th century. 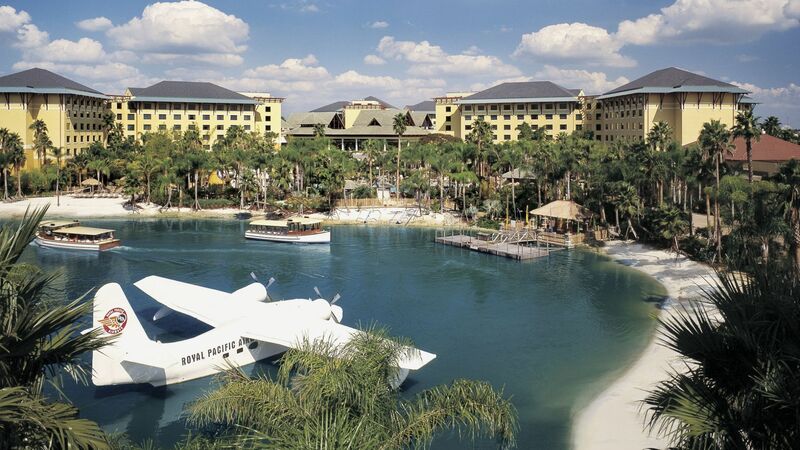 Loews Royal Pacific Resort at Universal Orlando™—where a tropical paradise meets an oasis of fun. Cribs/Rollaways: Cribs are complimentary. Rollaways are available on a first-come, first-served basis through Star Service Hotline for $25 per day, plus 12.5% sales tax (one rollaway allowed per room). Extra Person Charges: An additional charge of $35 per extra adult applies for more than 2 adult guests per room. Maximum occupancies may require a rollaway at an additional fee plus tax per day. Only one rollaway is allowed per room. Available on a first come first serve basis. Pet Policy: Pets are permitted for a $100 fee* in a pet-friendly room category (if you book a non-pet room, you’ll be re-assigned one upon arrival) with no more than two pets in any one guest room. Please make arrangements with housekeeping for daily room cleaning during your stay. Dogs may be walked in designated places and are not allowed at pool, lounge or restaurant areas. Should your pet’s behavior result in guest complaints, you may be asked to board your pet in an outside shelter. You must bring proof of your pet’s up-to-date vaccinations, as well as current records from a licensed veterinarian. Please note that Club level rooms do not participate in this program. For the complete Loews Loves Pets Policy, click here. Requires theme park admission. Valid at Universal Studios Florida and Universal's Islands of Adventure. Not valid at Universal’s Volcano Bay or at Pteranodon Flyers™ at Islands of Adventure. Excludes separately ticketed events. Park-to-Park admission required to board the Hogwarts™ Express. Benefit valid only for guests of Loews Royal Pacific Resort, Hard Rock Hotel® and Loews Portofino Bay Hotel, for the number of guests staying in the room for the length of hotel stay. Available during normal theme park operating hours only. Additional restrictions may apply and benefits are subject to change without notice. Universal Studios. All rights reserved. Based on average price of a 2-Park Universal Express Unlimited™ pass ranging between $99.99 and $169.99. †Paid theme park admission required. Early Park Admission begins one (1) hour prior to regularly scheduled park opening to either Universal Studios Florida™ or Universal’s Islands of Adventure™ as determined by Universal Orlando and Universal’s Volcano Bay™. Valid at select attractions at each park. Attractions are subject to substitutions without notice. Additional restrictions may apply. Universal elements and all related indicia TM & © 2018 Universal Studios. All rights reserved. *Fees subject to change without notice.